I wrote in my last column about redoing the rockery plantings here – a task finally completed after a good three weeks. When I say completed, I could just keep going on the margins and expanding onwards and outwards but other priorities call at this stage. In that column, I mentioned what we call the carpet garden as an alternative way to feature little treasures without the structure of individual pockets, raised beds and, in our case, several truck-loads of rocks. I don’t know if this genre of gardening has a different name but if you think of an oversized Persian rug, or maybe a patchwork quilt of random design created from tiny treasures, you may get the picture. This is not in any way to be confused with its vulgar and strident cousin – the traffic island geometric bedding plant displays composed of annuals which have a debt to the Edwardians. The French have a long history of doing these bedding plant displays with more ooh la la francais panache but they are still combinations of bedding plants. If floral clocks composed of African marigolds, blue lobelia, red salvias and pink bedding begonias are your thing, then so be it but they leave me cold. Altogether more refined is the plantsmanship in achieving mats of dwarf perennials. The finest example of this that we have seen is at The Garden House in Devon, on the edge of Dartmoor. Admittedly we were instantly won over by The Garden House on arrival because the very first significant plant we saw, in pride of place as one enters, was none other than Mark’s magnolia named for his father, Magnolia Felix Jury. It was an auspicious start for antipodean visitors and we felt a rosy glow of pride which I think was entirely justifiable. Leaving that aside, what is designated The Quarry Garden caught our attention. In this case it is an undulating carpet, planted through the site of a small quarry with some contour to the land. On a summer’s day in June, it was an entrancing patchwork quilt. We are talking plants such as the prostrate thymes, alpine phlox, spreading euphorbias, cistus and roscoea with the occasional vertical exclamation mark from echiums (which are more prized in UK gardens than here). I didn’t take plant notes, unfortunately, but I am pretty sure there were dwarf bulbs in there too. Little treasures again, featured in a garden style which allows them to flourish and to have their place. 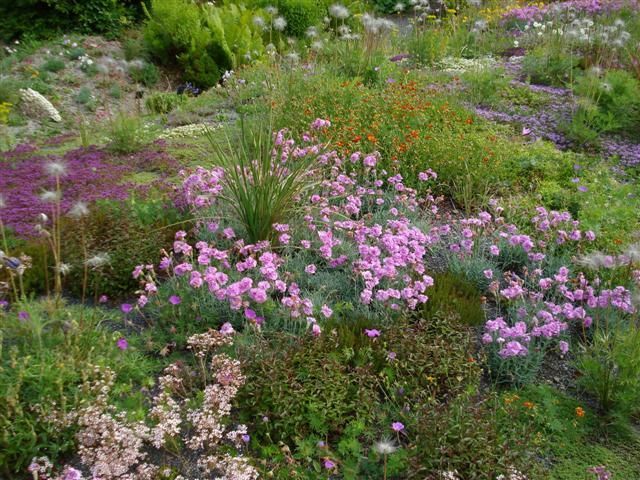 It is a style of alpine gardening, as is the traditional rockery, so it needs open conditions and to be kept free of bullying thugs of plants. 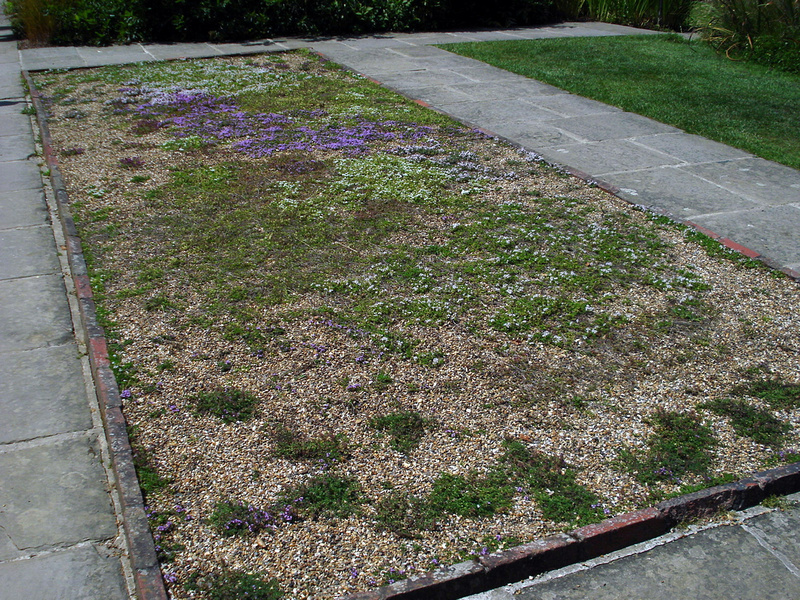 The other example of carpet gardens that we saw was at Sissinghurst and these, alas, were not memorable. Best guess is that they were designed to feature the prostrate thymes. As dead flat concrete rectangles surrounded by flat paving and lawn, they had all the panache and style of children’s sandpits given a new use. At a time of year when they should have been brimful of interlocking mats of ground cover, they were instead sparse and somewhat barren. We were underwhelmed. Naturally I wanted to come home and try a carpet garden in the style of the Quarry Garden we saw in Devon. I even mentally located it in a sunny, open position in our new North Garden. But ever the pragmatist, Mark pointed out that this style is extremely high maintenance. Not only is plant selection critical, when a garden is filled with ground hugging miniature plants, weed control is of the essence. You can’t be out with the push hoe or glyphosate in this type of garden. Nor can you rely on compost mulch to suppress unwanted germination. Upon reflection, I had to agree that he is right. It is a place which requires you to pick your way through gently, ever useful wonder weeder in one hand and bucket in the other, taking care where you place your feet. Readers who have tried planting chamomile or thyme lawns will know what I mean. 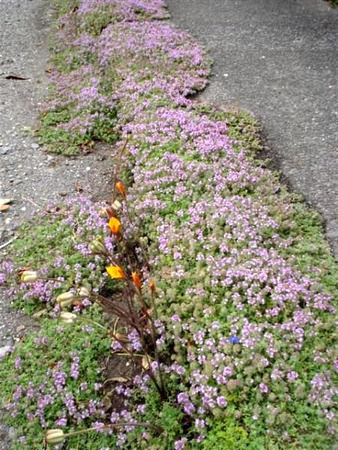 We have one stretch where we have a carpet of prostrate thyme softening the edges between concrete pathway and our driveway. It always seems remarkable to me that the thyme will grow on the concrete path with a mere few millimetres of accumulated dirt to set roots. But I work on that thyme carpet constantly to prevent weeds from getting established. The nasty little bitter cress can creep in, as can a dwarf poa (grass), summer grass and the creeping yellow oxalis. If I didn’t keep onto it, it would not take long to turn into a carpet of thyme and weeds. So my advice on the carpet garden concept is, first and foremost, don’t even think about it unless you are a very precise and fastidious gardener who is prepared for eternal vigilance and intervention. This is not for laissez faire gardeners at all. Not only that, but you have to constantly remove fallen leaves and debris. Immaculate maintenance is a critical part of keeping it looking good. Turn your back on it all for a season and you will likely have a scruffy, weedy mess. At this stage, I have shelved my ideas for trying one. Maybe it could be a little project in retirement. However, should you wish to try one, think ground hugging (prostrate) plants and miniatures along with dwarf bulbs. Little and low is the key. We are not alpine here so you will probably fare best with some of the thymes, baby campanulas, trailing lobelia for fillers, the true mini irises, small growing sysirinchium (there is a very nice little blue flowered one called Devon Skies that we bought from a local garden centre), dianthus, our native helichrysum which we have under the cultivar name of Silver Cushion (may be a selection of H. bellidioides) and the like. You could use verbascums for vertical accents and there are assorted bulbs which will grow tall but without large spreading foliage to smother surrounding plants. Albuca juncifolia fills this role well, in our experience. The long and the short of it is that you are going to have to be a bit of a plant collector as well as a careful gardener. Add in excellent drainage, open conditions and the traditional mulch of coarse gravel. There is no mystery to the carpet garden – just attention to detail if it is to achieve the magic status we saw at The Garden House. This entry was posted in Abbie's column and tagged Abbie Jury, carpet garden, English summer gardens on 29 January 2010 by Abbie Jury. It does appear to us at this stage as if the seasons are early this year. Mind you, winter struck early and with a vengeance so it is only fair that spring should similarly make an early appearance. With that comes a sense of panic. Should Rhododendron Rubicon be flowering in mid September and will we have any rhodos left to flower during Festival? We have enough experience to know that these things tend to even out over time and if the flowering remains early, at least our nuttalliis and maddeniis will see us through. But it has had our thoughts turning to the plants that really impressed us in an early English summer. We may need to draw on these for future festivals. Herbaceous peonies (or paeonia). Big frilly, fluffy, pink herbaceous peonies. They look fantastic, they need staking to stop them falling over and they don’t grow in Taranaki. Apparently they do extremely well in Central Otago and they are happy in a continental climate (dry, cold winters and hot, dry summers – rather the antithesis of here). We just have to admire them when we travel. And they are another short term wonder where they look just fantastic but then have a rather long time “passing over” as we say. Philadelphus, aka mock orange blossom. These we can and do grow though we don’t feature them as much as we saw in England. There are a wider range on the market there, including larger flowered forms and double forms. Facetiously, I would add they probably have forms with variegated leaves too. The Brits do love their variegated foliage and their yellow foliage. These affectations add colour and texture in their climate with its diffuse light whereas we shun them here where our unfiltered sunlight burns them. The philadelphus is known as the mock orange blossom, I assume, because of its wonderful fragrance. It makes a large deciduous shrub – most forms get to 3 metres if you don’t trim them. Cornus kousa was great all round the country. It is the dogwood from China and Japan – a small tree with flat flowers favouring pink but can also come in shades of white, cream and green tinged. We have a nice pink flowered one in our garden though it is a little poorly these days. There were a whole range of different selections in the UK, including some very large flowered ones and some top pink forms. We need to have a closer look at kousa. The American dogwood species don’t do as well for us here (they get decimated by the puriri moth) but kousa is a different story. In the perennials, the stand out plants were alliums, verbascums, astilbes and eryngiums. Alliums are onions, though ornamental onions in this case. Some forms put up wonderfully decorative large spheres of purple and I wanted them instantly. Alas these archetypical inclusions of the English summer border are not really any easier there than here and the bulbs are often bought in annually. What a wonderful feature plant they are, though. The famous Beth Chatto Gardens list no fewer than 21 different ornamental alliums in their 2009 mailorder list. Tulbaghia are onion relatives. English gardeners love to amass what are called National Collections of each and every plant genus, often in private gardens. We visited one garden which proudly proclaimed itself as the holder of a number of national collections, including tulbaghia. Hah, declared Mark, commenting that he thought there were only a very few different tulbaghia species. He was right. They are a small plant family, modest in number and modest in appearance. And indeed the National Collection of tulbaghia was considerably more impressive on paper than in reality. But it did give Mark a new claim to add to his repertoire. He has since been heard to proclaim: “Ah. But I have seen the national tulbaghia collection.” We do grow tulbahia violacea here but truly it looks a little chive-like. Verbascums put up tall spires of flowers, typically yellow or white, with a rosette of leaves at the base. Great Dixter used self seeded verbascum spires as a repeated flower motif throughout the garden so we felt we were in good company as we too have a large flowered yellow form which is a biennial through our rockery. But we only have two forms and there are more than that which we will be tracking down for summer displays. We have tried and lost the most impressive verbascum, a splendid grey felted rosette with an impressive flower spire. Time to try it again. Eryngiums are sometimes called sea holly and are mostly somewhat prickly. We have a lovely blue form in our rockery and it was because one was planted too close to the pathway that I discovered they have phenomenally deep and sturdy taproots. It makes them difficult to move. Eryngiums were used widely in English gardens, being tolerant of dry. There is a large form of the plant, eryngium giganteum, now called Miss Willmott’s Ghost. Said Miss W was a fine gardener but possibly a cantankerous old biddy who was a law unto herself. Allegedly, she made a practice of secretly scattering seed of eryngium giganteum in gardens that she visited so that the large, silvery plants would rise, ghost-like, long after her visit. Apparently eryngiums will seed down and many are biennial so only last two years. All I can say is the one I have in our rockery is a deciduous perennial and it has never yet self seeded, though I would be pleased if it did. Astilbes. I fell in love with astilbes and the national collection of these at Marwood Hill in Devon was worth looking at. Big fluffy plumes in shades of white, cream, pink and rusty reds, all happy in damp areas but also preferring some shade with our harsh sun here. We visited Hollards Garden in South Taranaki last weekend and noticed their dell held the promise of a good display of astilbes later in the season. We can grow them here in the north, but they just don’t like being built up in nursery conditions (weevils seem to sniff the pots out from afar and move in) so we need to be more organised and build them up in the garden, not the nursery. We were greatly taken with aruncus as soon as we saw it. Aruncus is a rather like a giant creamy astilbe on Eastern European steroids, ideal for wild or natural gardens. It needs space, at least a metre and a half across. We fell out of love with it equally quickly when we realised it had a short season and its beautiful creamy plumes of flowers turned brown and hung on, so it just looked burned. We noticed Persicaria polymorpha filled the same niche and a skilled gardener confirmed that this plant passed over more gracefully. The stand out beautiful garden plant was a grass at Beth Chattos. I have now lost the piece of paper where I wrote its name down but I am sure it was a stipa. It is rather academic anyway because if there is one plant group that we will never be allowed to import new family members into this country, it will be ornamental grasses. Oh, and the ornamental thistles which looked great. The most truly awful plant we saw was widely grown, though goodness knows why. It was a thoroughly nasty spirea. Clumping yellow leaves (may even have had some sort of variegation to make it worse) contrasting with a yukky mauve pink flower. It was a good argument for glyphosate. This entry was posted in Abbie's column and tagged English summer gardens, perennials, Travels on 18 September 2009 by Abbie Jury. Note: this follows on from the earlier column: English Summer Gardens – part 3. I wrote two weeks ago about the English summer garden being a continuum stretching from natural meadows through to plantings on the sides of motorways or NZ traffic islands. I was gently drifting my way along this journey until I reached my word limit around the classic English country garden as exemplified by Penelope Hobhouse and the late Rosemary Verey. I had to stop there because suddenly there is a great big punctuation point with the late Christopher Lloyd at Great Dixter. Great Dixter can be controversial. Mark stood in the garden and commented that it was a bit like an ongoing negotiation with nature. At its best, it is gifted and has clearly had an enormous influence on the direction taken in many New Zealand gardens. In the middle it can be somewhat serendipitous, but there are parts where there is a suspicion of the emperor’s new clothes. As a garden it sits between the meadow gardening–wildflower end of the spectrum which relies on a great deal of self seeding (and good chance) and the controlled Edwardian arts and crafts style synonymous with Edwin Lutyens and Gertrude Jekyll. Christopher Lloyd experimented all his life but his legacy to modern gardening is arguably the mixed border (using shrubs and clumping perennials in tandem and brave colour combinations) and the managed meadow. In New Zealand, we seized on the mixed border as if it was our own but alas it is not often carried out with the panache of Christo Lloyd and is frequently rather dull. Historically Lutyens and Jekyll pre-dated Christo Lloyd and in fact Lutyens redesigned Great Dixter for the Lloyd parents. But on my continuum, they are more to the ordered and managed side. We travelled in part to see their legacy. 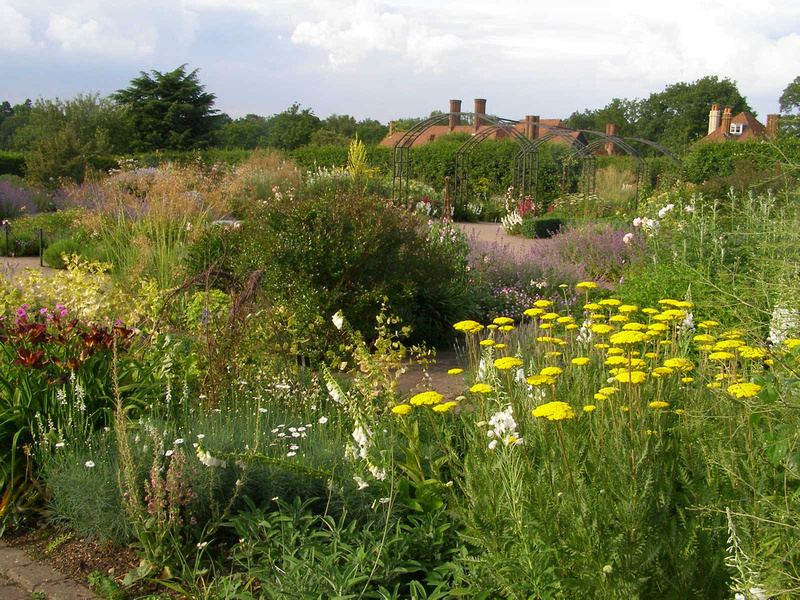 Famous examples are Sissinghurst and Hestercomb but we also visited lesser known gardens. The spirit of the Lutyens-Jekyll style was formal landscaping by Lutyens in the Arts and Crafts mode (confined and defined spaces of the garden room type), softened by sweeping plantings designed by Jekyll. If you imagine beautiful stone work, clipped hedging, masses of blue delphiniums, extravagant fluffy pink peonies, pink and white roses and drifts of underplanting such as lambs’ ears (stachys), you will be on the right wavelength. It is very pretty although the borders and beds could be a bit on the narrow and busy side and it can get a little formulaic when you see a number of such gardens in a row. I suspect that it may be a little dated now. Certainly the very narrow borders worried me and I would want to rip them out. Keep the trademark Lutyens rounded stone steps, though. Nobody does steps like Lutyens. Fortunately it was towards the end of our trip that we ended up at Wisley because there we saw a range of garden styles which gave us the framework to make sense of what we had seen. Cue in the classic long border. Yes Great Dixter has one but Wisley sets the standard. Hyde Hall has a shorter long border divided into colour segments. Lots of gardens have the long border. At its Wisley splendour, it is two parallel borders with a wide grassy path between and we are talking a hundred and thirty metres long, each, and (here is the rub for many home gardeners) six metres wide. Beth Chatto’s garden is a whole series of freeform borders which curve and flow but are still following the principles of the long border. Such borders are often planted on terrain contoured to give extra height at the back. Because they froth out at the front (alchemilla mollis is a great favourite to achieve this effect and seems to be regarded as colour neutral), there is often a boundary of wide pavers defining the edge. This stops the frothing from killing the grass. Generally plants are layered from tallest at the back to lowest at the front and the crux of this type of planting is combinations of plant foliage and flower throughout the season. There is no mass planting. Many plants will need staking and deadheading and it is all extremely labour intensive. You need plenty of space for this type of voluptuous display. For us, this is the zenith of summer gardening. On the days we visited, we ranked Beth Chatto top of the list for plant combinations and quality management of this intensive style of gardening, Hyde Hall top in genuinely original colour and flower combinations and Wisley all round top in the total package of scale, design, plant combinations and management. But, Wisley does not stop at the long borders. Dutch designer Piet Oudolf has moved herbaceous planting on a few steps and, in front of the spectacular new glasshouse, Tom Stuart-Smith has taken it further. There is an element of modern pragmatism and indeed we were told that the new borders only require a third of the input of the traditional long borders and that is a huge difference. The Oudolf borders have attracted both praise and criticism. They are a great deal more controlled. The plant palette is restricted and most of the plants chosen do not require staking (or, I think, regular dead heading) and they are pretty much of a standard height. But it is not mass planting and the skill of striking plant combinations remains to the fore. Oudolf has worked with parallel borders again but used different plant combos in rivers flowing across, more or less in diagonal lines when viewed from above. Each river is comprised of three or four different types of plants. Tom Stuart Smith has further refined the Oudolf technique, bringing it together with the sweeps of colour first espoused by Gertrude Jekyll and the prairie meadow concept currently in vogue to give grand sweeps of herbaceous plantings for the larger canvas. Much of the detail and complexity of the long borders has now gone, as has the need for intensive maintenance. But plantsmanship and design lifts it well above utility mass planting and while it may not appeal for smaller scale domestic gardens, it is a modern and more practical approach for public plantings. So how do we end up at the traffic islands filled with tussock or the motorway sidings of utility clumpy plants? Take the simpler blocks of colour planting done by Tom Stuart-Smith. Eliminate any plants that are pink flowered (not fashionable), anything that is deciduous (need foliage 12 months of the year), anything that is grown more for its flowers than its foliage, anything that requires more than a very occasional clean up. You are left with reliable, utility, evergreen clumping perennials which in recent years have become the repertoire of many landscapers for mass plantings – the liriopes, mondo grass, ligularia type of plant. Now reduce the range further. Take out any plants which are less than 30cm high, any plants which require good soil conditions or shelter, any plants which look sufficiently desirable to be stolen, and any plants which are not available dirt cheap and preferably from a native plant supplier or prison nursery. You are left with mostly tough grassy type plants which on their own are as dull as ditchwater. It is the end of the road. This entry was posted in Abbie's column and tagged Abbie Jury, Edwin Lutyens, English summer gardens, Great Dixter, herbaceous plantings on 7 August 2009 by Abbie Jury. We went to England to look at summer gardens which are all about flowers, particularly perennials and annuals. We didn’t expect to see so many meadow gardens and nor did we have the perspective of the summer garden as a continuum. At one end, we saw natural wildflower fields, grazed by sheep and not managed as gardens at all. 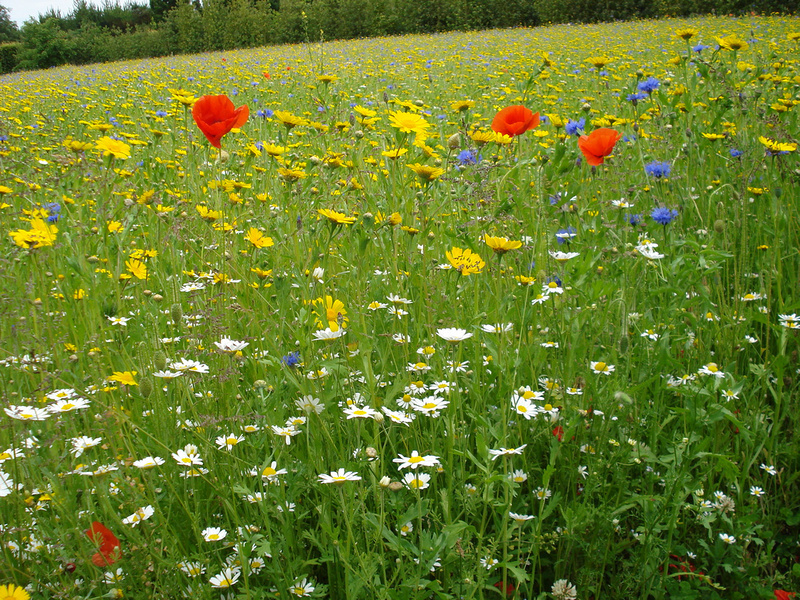 There are two key aspects to understanding British meadows. One is that many of our weeds in this country are in fact wildflowers in their home environment. So what might be seen as a rank, unloved and weedy infestation of dandelions, stinging nettle, daisies, convolvulus and blackberry is an entirely appropriate and acceptable meadow garden in its natural setting. Add in other elements such as cowslips and wild orchids (dactylorhizas and anacamptis pyramidalus) and you have something altogether delightful. The second aspect is that wild flowers thrive in a climate that is cold enough to stop all growth in winter and dry enough to stunt most growth in summer. These are hardly typical Taranaki conditions. Inch along the continuum and you discover managed meadow gardens which were integral to most of the large gardens we visited. The late Christopher Lloyd of Great Dixter was an influential figure in popularising and enriching the meadow garden genre by encouraging a wider range of wild flowers to naturalise. The general rule of thumb for managing meadow gardens is to cut the meadow down in August (the equivalent of February or March in our hemisphere) and to leave it lying for about three weeks. This allows the seed to distribute. The hay is then raked off the meadow in order to keep the fertility low. If the soil is too rich, the growth becomes rampant and grasses will dominate. The existence of a parasitic annual referred to as Yellow Rattle (Rhinanthus major) helps to keep the grasses weakened. Meadow gardens appeal to the romantic and naturalistic instinct cherished by the English. It is not seen at all as scruffy or unkempt and it is fine to have a designated meadow area as your main point of entry to the garden. The naturalism is often combined effectively with that most prim and proper of all gardening techniques – topiary. Great Dixter does it – the large clipped yew shapes created by Lloyd Senior now stand in the midst of an informal meadow. At Helmingham Hall in East Anglia, an undulating wave of pathway is cut through meadow grasses which surround large clipped yew domes. I don’t see many New Zealand gardeners managing this meadow genre. Our soil fertility is too high, our grasses grow too strongly and will choke out most competition, our torrential rains will flatten meadows even in summer and if the rain doesn’t do it first, then winds will. Our nitrogen levels are too high. And we tend to be a bit anally retentive and suburban, dedicated to manicured lawns and edges, let alone to glyphosate, to tolerate the casual live and let live philosophy of the meadow. Take another step along the continuum and there is the completely contrived and totally enchanting field of flowers (without grasses). We saw this done at East Ruston Old Vicarage Garden where the field of yellow daisies had hints of blue cornflowers and red soldier poppies and it was so perfect that it took our breath away. 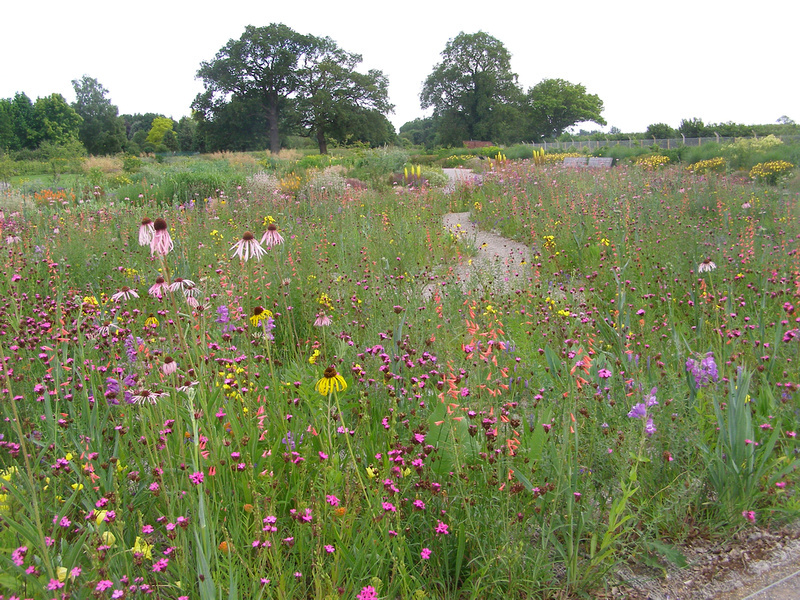 If you start with bare earth, in the first season there are no competing grasses or weeds so all that is seen are the desired annuals. By the second season, competing plants mean that you are closer to the managed meadow situation. We are now moving into a style of gardening which has a debt to the North American prairies and the prairie meadow style reaches a pinnacle at Wisley Gardens where Professor James Hitchmough from the University of Sheffield is responsible for one of the most delightful meadow gardens of perennial flowers that you will ever see. Apparently the inspiration was Missouri meadows but the execution of the vision was achieved with gardening skills. The brief included a requirement that this garden be easily managed by Wisley staff so it went in to an area which had been cleared of weeds and grasses and probably also cleared of much of its topsoil. A rope mesh mat was laid, allowing the plants to stay anchored and a carefully chosen palette of about ten plants from seed mixed with sawdust was sown to create a sea of perennial flowers. There wasn’t a lot of foliage evident and the plants were tough performers which thrived in hard, dry conditions. It was magic. It was also in its second season already and there was no evidence of weed or grass contamination although it must be said this is managed with some ongoing minor intervention. Move along the continuum further and you get to the classic cottage garden style which the English made their own. Cottage gardening is an indulgence of self seeded annuals and perennials, usually combined with roses, along with other shrubs and climbers such as clematis. The effect is a riot of colour and flowers with nothing so contrived as colour toned borders or stage managed plant combinations. Plants should look as if they are growing naturally where the seed falls and hard landscaping takes a back seat in this informal, romantic look. Readers who know the Armstrong’s garden in Waitara will have seen a rare local example of this gardening genre. If you have yet to visit, go and see it this Rhododendron Festival. Alathea Armstrong has it peaking to perfection for that week and it is very pretty, albeit labour intensive. But take another step along and you come to what I call the managed cottage garden look which I associate with English gardeners such as Rosemary Verey and Penelope Hobhouse. The romantic naturalism is now combined with hard landscaping, form and formality. It is much more controlled, as can be seen in the Hobhouse Country Garden at Wisley. Colour toning becomes a major factor. Deadheading becomes intensive in order to prolong the display. Planning for successional flowering from spring to autumn is important. Constant management means spent plants are cut back and holes are plugged by bringing in fresh potted colour from out the back somewhere. Weed management becomes more critical. Many of the plants need staking. We talked to Lady Xa Tollemarche at Helmingham Hall about her borders and she manages to keep them at a peak for several months. The English do this classic garden style so well but it is not for the home gardener who sees spending every spare minute in the garden as a form of slavery. Easy care and low maintenance, I think not. We are, dear Reader, only half way along the continuum. How silly of me to think I could summarise all we saw and talked about in 1200 words. We need to pause in the middle before moving on next instalment through the mixed border a la Christopher Lloyd, the sweeps of herbaceous colour softening formal landscaping in the style made famous by the Lutyens-Jekyll partnership, moving through the classic and intensive long borders to the recent work of Piet Oudolf and Tom Stuart Smith and onwards to the modern minimalism of mass planting. There is still quite some distance to go and any number of points where thinking gardeners can hop off the continuum, comfortable that they have found the point that best suits their situation. This entry was posted in Abbie's column and tagged Abbie Jury, Abbie's column, English summer gardens, meadow gardens, wildflower meadows on 24 July 2009 by Abbie Jury. When I packed for our English trip, I packed for an early English summer. That is to say that I anticipated a temperature range in the vicinity of 12⁰ to 22⁰. Not 32⁰ which is what we ended up in – soaring even higher as we crawled the M25 in a car which was not air conditioned. England is generally regarded as a moderate maritime climate, lacking extremes experienced by inland continental areas. But as we looked at extensive snow damage to large conifers at Hidcote Garden in Gloucestershire, bone dry conditions in East Anglia and Surrey where the annual rainfall is a mere third of what we get here and thin, poor soils on top of chalk in many areas, it made our conditions look easy. And bunny rabbits may be native to England, but it does not make them any easier to cope with. We have been complaining about a minor population explosion at home but believe me, it is nothing to what we saw over there. Super bunny is fearless and everywhere, grazing at will. Pretty well all plantings outside urban areas need rabbit protection. Even hedgerow plants all went inside individual plastic sleeves. Add in voracious grey squirrels, invisible but destructive moles, badgers who insist on excavating their own version of the Clyde dam, marauding foxes and various birds of prey. At times, nature seemed rather more savage in that well tamed country than we expected. Over a period of a couple of weeks, we visited about 30 gardens. By the end of that, we felt we had a reasonable grip on a range of gardening practices particularly with regard to herbaceous plantings but you will have to wait for my next column for any analysis. While I blithely deny jet lag, the brain is still a little woolly. So this week is edited highlights, Hidcote, Beth Chatto Gardens and Wisley. “Go to Hidcote,” urged our Oakura friend and colleague, Glyn Church, “it is my all time favourite garden.” Having been ever so slightly disappointed in most of the Cornish private gardens we had seen, we headed up to Gloucestershire and hoped Glyn was right. He was. Hidcote was quite simply everything to which we aspire. I have gone on record before saying that there are measurable and definable standards for gardens. That whether you or I like a garden is a matter of personal taste but whether it is a very good garden is not just opinion. Hidcote excelled across the board. It was very well planted, it was managed with sensitivity, it showed excellent design and structure, the maintenance was top quality. But more than that, for us Hidcote was on a scale we can relate to (it is a defined 10 acre garden) and quite simply, it set the standard for the genre that we like. It was the complete, all round domestic garden. To visit it was gardening nirvana. Apparently Hidcote has not always attained this standard in recent years and it is nearing the end of a £3 million makeover (yes, that is three million UK pounds) so it should be looking good. And with about 10 qualified gardeners on the staff, the skilled labour component is well beyond what we can ever hope to reach. It is owned by the National Trust and it must be a flagship for quality management of what was a private garden created on a domestic scale (narrow paths and entranceways) now coping with very large visitor numbers. But the garden has not lost the intimacy or detail that defines a private vision. It was one of the early Arts and Crafts gardens, using rooms or defined spaces to mark changes of atmosphere and plant types. Photos are all very well, but to actually visit was to experience the gifted use of vistas, borrowed views, green rest areas between busy plantings, different types of plantings and all the other layers that go together to make a brilliant garden. The red mixed border was terrific. We walked out after several hours like stunned mullets. The famed Beth Chatto gardens in Essex on the same site where she has gardened for many decades. We were privileged to have close to half an hour with her personally taking us around part of the garden and although she is now elderly, she has lost none of her mental sharpness and still appears to be very active managing what is now a pretty massive machine in terms of large, intensive garden, nursery, tea rooms and a constant flow of visitors. Beth Chatto is synonymous with perennials, both as a writer and a gardener. Her reputation is such that even my late mother (who died several years ago at an advanced age herself) always regarded Mrs Chatto as The Expert. And her gardens were so good that we had to go around twice, once going one way and then in reverse. Decades of intensive skilled gardening show in plant composition, plant health and management. Putting together combinations which are eyecatching and effective even without any flowers is not easy with perennials. Avoiding the scruffiness which can come with herbaceous material past its peak, keeping very tight weed management and restricting the movement of invasive wanderers, stopping it all looking the same – there was so much to learn from these gardens. It is not as if there was much hard landscaping and I can’t recall garden ornaments or sculptures – this was a brilliant garden that was all about plants and plant combinations. Wisley was our third garden that provided a completely satisfying experience. It is the flagship for the Royal Horticulture Society – over two hundred acres of property encompassing pretty well every aspect of gardening that you are ever likely to encounter. Its scale is astounding and so is its quality. It must surely rank up amongst the very top public gardens in the world. We were in the extraordinary position of having access to Wisley out of hours, after the thousands of visitors had gone home. Wisley is not just about plant collections and public gardens. It has a strong educative and comparative research function and to this end they have display frames of all fruit trees that they can grow, including different cultivars. We were worried that nobody appeared to be sufficiently rigorous with the assessment trials of the ripe cherries in particular, as well as the berry fruits. Left alone in the gardens, we spent some time working out how to gain entry to various netted cages but decided it would be all too embarrassing to be caught stealing fruit so we had to settle for the pieces we could wheedle out through the protective layers which reduced the efficacy of our assessments. What Wisley showed us (besides the fact that stolen fruit does not always taste the best – Mark encountered the sour Morello cherries) was a whole range of different approaches to herbaceous gardening with examples by a number of different designers over a period of years, including very modern plantings around the new glasshouse. It gave us a series of reference points for what we now think is a continuum stretching from wild flower meadows through a range of styles and eras to an end point of herbaceous plantings best characterised by the massed utility grasses on motorway embankments. And for our thoughts on that, you will need to wait another fortnight. This entry was posted in Abbie's column and tagged English summer gardens on 10 July 2009 by Abbie Jury.